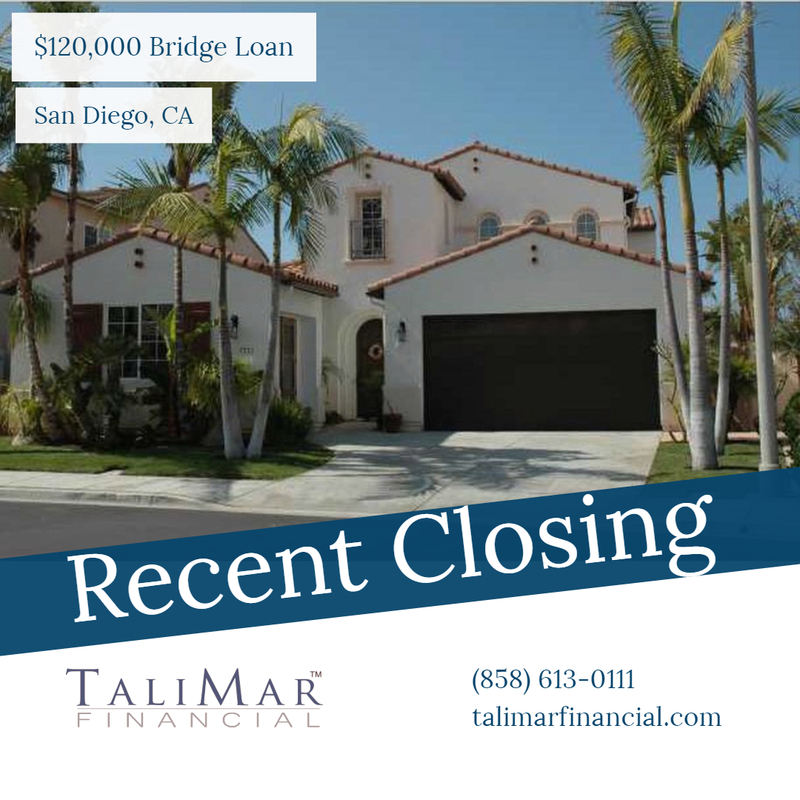 San Diego, CA – TaliMar Financial is pleased to announce its most recent funding of a $120,000 bridge loan secured on a single family home in San Diego, CA. The Borrower was seeking a short term cash out refinance. TaliMar Financial is a hard money lender that specializes in funding fix & flip, construction and bridge loans in California. As a direct lender, TaliMar Financial can fund loans within 5 business days and offer aggressive financing options. For more information on TaliMar Financial and our hard money lending programs, please contact Brock VandenBerg at (858) 613-0111 x1 or visit us online at www.talimarfinancial.com. TaliMar Financial, headquartered in San Diego, is recognized as a leader in financing residential and commercial real estate. We are a direct lender, operating from a position of capital strength that allows us to secure immediate funding solutions for our clients. Copyright © 2019 | TaliMar Financial Inc. | All Rights Reserved | RE Broker CalBRE License No. 01889802 | NMLS ID 337721 | Web Design by Dog & Rooster, Inc.